The Air Jordan 13 Low Quai 54 “Black” is the latest Quai 54 x Air Jordan to surface after taking a first look at the Air Jordan 13 Low Quai 54 “White” version. Both pairs are designed to commemorate this Summer’s Quai 54 tournament at Trocadero in Paris. The Quai 54 Jordan Brand-sponsored International Streetball Tournament is where you can find the top streetball stars from all over the globe to try and win the ultimate title of Quai 54 Streetball World Champions. This Quai 54 “Black” version of the Air Jordan 13 Low is dressed in a full Black 3M Reflective mesh overlay and tongue upper that includes a special edition logo on the tongue that references the Quai 54 tournament. The same graphic print detailing hits the sides, a Chrome Jumpman branding is seen on the upper collar that is completed with another Quai logo on the Gum outsole. Check out the official photos of the Air Jordan 13 Low Quai 54 “Black” below and look for them to release exclusively to Europe Jordan Brand retailers on Saturday, June 13th, 2015. 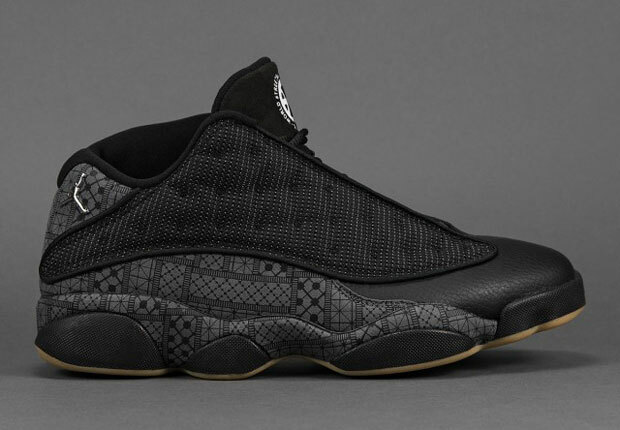 UPDATE: The Air Jordan 13 Low “Quai 54” was a limited release in Europe and now they are receiving another release set to take place this Friday, June 26th at German boutique Solebox. Still no word on a stateside release, but stay tuned for further updates.